Functional Medicine allows the physician to see things and their interconnections in a holistic fashion. Functional Medicine for multiple sclerosis regards MS as a disregulatory disease of the immune system (too much pressure on the accelerator, not enough pressure on the break). All autoimmune diseases and disorders, from MS to arthritis and psoriasis, are seen as the same problem manifesting differently in different people. When you go to your doctor with a complaint, in standard medicine the doctor “pairs away”, trimming and trimming at different options and possibilities, until he or she gets to a diagnosis. Once a probable diagnosis is found, the doctor will do the confirmatory testing and then look up and prescribe what the standard therapies and drugs are for that particular diagnosis. This way of addressing disease never gets to the root of the complaint and what is making you not be healthy. We need to remember that this is not an infection or virus we need to get rid of. This is something your body shouldn’t be doing in the first place and the why of it is not explored in standard medicine. So, what can be making you unhealthy? In Functional Medicine, the objective is to understand what the root of the disregulation is and then support re-establishing health. The causes can be many. Functional medicine looks for possible causes in our physical environment and our history such as foods, toxins, medication, and genetics. Unlike standard medicine, the psychosocial causes are also taken into account. These causes include adverse childhood experiences (ACE), the stress of your mother during pregnancy, toxic relationships, work environment, grief and loss, coping skills, and lack of close community and support systems. Additionally, the practitioner looks at antecedents (your family history) and at triggers. Triggers both before the onset of your MS as well as before each exacerbation. Events such as a big move, a marriage breakup, bereavement, or changing to a more stressful job can all act as triggers. Functional Medicine does not consider multiple sclerosis to be caused by these triggers, only activated – a spring that was already wound up too tight. 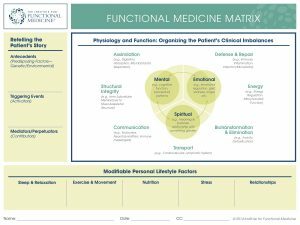 Functional Medicine Matrix reviews all the areas that can produce imbalances in the system, from leaky gut, microbiota, hormones, lymphatic system, toxicity, energy, inflammation, infection as well as lifestyle. In the middle of the matrix are the psycho-mental-emotional-spiritual aspects. The practitioner is interested in what sort of challenges you’ve experienced as well as what kind of support you have. Challenges such as “Are you taking care of an aging parent?” “Are you worried about a grandchild in a challenging situation?” “Did you have or witness abusive as a child?” Also, “Can you connect with a higher power and is that part of your life?” These psycho-mental-emotional-spiritual aspects have been show in research to be a very important component in modulating your immune response. Functional Medicine looks for the root of immune diseases such as MS all the way back to childhood as well as what is happening now that could be contributing to your multiple sclerosis and the existence of undesirable T-cell clones. 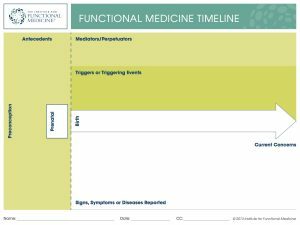 The Functional Medicine Timeline is a tool that helps the practitioner review and collect information regarding family history, the state of your mother before birth (was she over stressed? ), to type of birth, if you where breastfed, if you took antibiotics at a young age, if there was abuse in childhood, to medications, even as presumably mild as Advil. All of these aspects could be contribuint to the MS.
With multiple sclerosis, everything that is driving inflammation has to be attended to. Two key areas an FM practitioner will begin with a client with MS is to testing for leaky gut and the levels of vitamin D.
Do basic tests such as 25-Hydroxy vitamin D3 blood test and THF4. Test for leaky gut. One way to test for leaky gut is Zonulin. If this is elevated, you have leaky gut. If you have a leaky gut it’s important to treat it as its like pouring starter fluid on an open flame. Check the health of your gut’s microbiome through stool and flora testing. This presentation was given by Dr. Dawn Motyka at the MS Self-Help Group in Santa Cruz, California. For more information on Dr. Motyka, visit www.optimagehealth.com or call (831) 421‑0197. For more information and to find a local Functional Medicine practitioner, visit the Institute of Functional Medicine. For research on the relationship between your gut flora, multiple sclerosis, and inflammation. This presentation is part of the Creating Health series. If you would like to receive these presentations in your inbox, subscribe to our newsletter. In this month’s series, we interview Karen Curry regarding multiple sclerosis and human design. Karen is an international speaker and bestselling author of “Understanding Human Design The New Science of Astrology: Discover Who You Really Are.” Her personal development firm uses Human Design to help her clients discover their unique gifts and best strategies to create a healthier, wealthier, and most fulfilling life. Karen, a former nurse, has also developed a program, “Healing by Human Design” to help people get to the heart of their pain: physical, emotional, mental or spiritual. 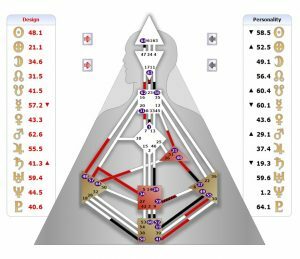 Human Design is a personality assessment tool based on our birth date, time and place. 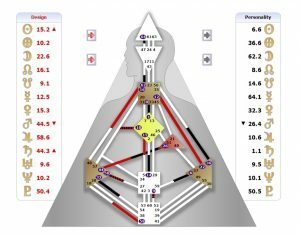 It incorporates Eastern and Western Astrology synthesizing it with the I’Ching, the Kabbalah, the Hindu Chakra System and Quantum Physics. The result is an amazing tool that allows us to understand our unique blueprint and way of being in the world. Human Design helps us understand how each of us is meant to use our energy in the world, how each of us best takes decisions, what our gifts and talents are, where we might lose sight of ourselves and become ill, and our potential for healing. Through the lens of Human Design and Karen’s experience, one of the possible root causes of chronic disease is that we spend too much energy being who we are not. 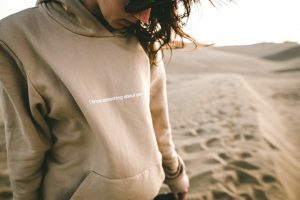 Society, our family’s genetic code, our experiences, and our collective beliefs about who we ‘should be’ mold our behaviors and ways of being. When these behaviors and ways of being don’t fit our energy blueprints, they end up requiring our bodies to spend excessive energy trying to hold up an allusion or mask that isn’t us. If one holds this mask for too long, the body burns out. Human Design helps us discover what is our unique energy blueprint so that we can live more in accord with who we are meant to be. One of the things that Human Design teaches us is that there is no one size fits all formula – for living well, for health, for ways to get burned out, or for getting particular diseases. In the case of human design and multiple sclerosis, there might be tendencies in common yet each chart is individual. Each person’s chart can show us where that particular person might spend energy being someone they are not that might eventually lead to disease and burnout. 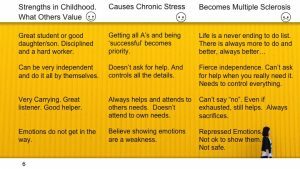 The chart can also show us a person’s individual formula for what their bodies require (time to rest, joy, time alone, etc.) to work optimally. In the chart example below of someone diagnosed with MS, this person has gate 29 defined (see the black vertical line coming out of the red box in the lower-center of the chart). A person with this gate has an extreme body barometer. This means that their bodies will tell them very clearly, “Hey, I’m done. This is too much.” (while someone without this gate defined might not have such an immediate body response when they’ve done too much). This same chart also has a defined (small triangle on the right) Will Center. Interestingly enough people with defined Will Centers absolutely need consistent cycles of rest. If they save their vacation time for later and stop taking breaks trying to prove their value by overworking; they will become extremely depleted. This center is the center of vital aspects of the immune system. When those with this center defined don’t give themselves consistent cycles of rest (rest meaning play and deep rest not working on your computer in the backyard or lay on the coach but worry about work), they can burn out. This kind of burn out is not just mental (I hate my job), but physical (I have no energy to keep doing this). In Human Design, areas in our chart that are white or “undefined,” are areas where we can absorb other people’s identity and loose connection to who we are. We can live other people’s stories rather than our own. The next example charts below, and the majority of charts of those diagnosed with MS that Eva M Clark sent to Karen for this interview, all had an undefined Sacral Centers (box second from the bottom). 30% of the general population have an undefined sacral. This is the center for workforce and life force energy. Because it is white in so many of the charts of people diagnosed with MS, the majority of those with MS “borrow” or absorb other people’s energy. Borrowing energy feels awesome, yet it’s unsustainable as it is not one’s own. If you have an undefined sacral and try to work like you see so many people around you, working from 9 to 5 and trying to prove yourself through your hard work and sacrifice, you will burn yourself out midway through life (35 to 40 years of age sometimes earlier). Those that try to be workhorses when they do not have a defined Sacral Center will eventually find themselves struggling to get out of bed because their bodies will not collaborate. They are wiped out (this kind of fatigue could be what many describe as the “MS sleeps”). As Karen points out in the interview, a 2-week vacation is not enough if you have run yourself into the ground in this way. This might result in long-term need of rest and restoration. It often times take as long to get unburned out after getting burned out in this way. Not just resting the body, while your mind is a mile a minute, for you burn just as much energy, but a total rest of body, mind, and spirit. One of our struggles in this society is that we’ve related self-worth with work. Society has erroneously said those with Sacral Centers defined have worth (70% of society) and those that don’t have it defined don’t. What is beautiful about Human Design is that it teaches us how to get off the treadmill of societal expectations and definitions of worth and understand our unique value and to share that as our contribution to the world. Some people have thrown into the adventure of some kind of illness into their life path as part of their soul’s journey. Sometimes people get illness because its the marker that they are out of sync and not being our true selves. Sometimes its literally the toxins in their environment and it has nothing to do with theirmindset or behaviors but just an unfortunate series of events. “There is no one formula for healing as there is no-one else like you” says Karen Curry. She advises us to listen to different modalities and if we don’t resonate with it, don’t use it! Know you are not an accident. We all have a unique place in the cosmos. That occupation that you fill IS your contribution. There is not something you have to do as your life purpose and then burn yourself out trying to find that thing to do. According to Human Design, your being and maximizing the full expression of yourself is the purpose. Start following the things that you do that make you feel better. We are so conditioned to think that it has to be hard work and that we will need to sacrifice. In Karen’s practice, she constantly asks her clients “Does that feel good?”. If the answer is “yes” at that moment, then she asks them to do more of it and if its “no” then to stop. Sometimes the body just needs a couch day and if being on the couch feels really good and we are open to experience a couch day, then we can benefit from that experience. Explore the beliefs behind the guilt, resistance and should’s that are keeping you from following what feels good. If we are in resistance, feel guilty because it feels so good or decide we ‘should’ be doing something else because we’ve bought into a formula of some kind of what is appropriate, then we won’t benefit from the experience. 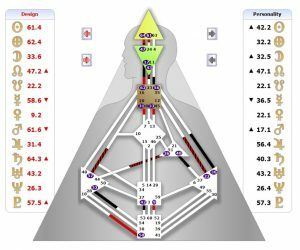 Study your Human Design chart and understand your unique blueprint, especially how you are meant to use your energy, your decision strategy, and what areas to address that might be affecting your multiple sclerosis. Work with some kind of energy psychology techniques such as EFT, NLP, and hypnotherapy to unprogram and reprogram your beliefs. Support the process with subtle body therapies such as acupuncture or energy healing to stabilize the energy as you continue to make cognitive and emotional shifts. Give yourself time. It’s not hard, but it does take time. To get your free Human Design chart and material to begin to understand your blueprint, visit Karen Curry’s site, Human Design for Everyone. Visit Eva M Clark’s Healing Multiple Sclerosis Program to unprogram and reprogram your beliefs. To learn more about the beliefs and patterns behind multiple sclerosis, visit the post The Mental Patterns of MS.
Read and watch our Creating Health presentation on how Chinese medicine and acupuncture addresses multiple sclerosis. If you would like to receive interviews and models of healing multiple sclerosis, subscribe to our newsletter. Are You Trying to Manage Your MS? Then best to stop now if you ever want to recover from multiple sclerosis. Telling yourself and others that you are “Living with MS” can be detrimental. Why? Say those words to yourself right now and answer the following: Is there a sense of empowerment? A sense of hope of improvement? Drive for change? Direction? Motivation? Probably not. There is acceptance but no direction for recovery. What about when you are managing your MS symptoms? What are you telling yourself “neuro-linguistically” (to your mind with your words)? And how does that influence outcome and expectation? To give you an example that might be easier to understand, imagine if we were trying to lose weight. Does practicing “weight management” let us know we will be successful and never have to look back at those old ways of being with and relating to food? How about managing overeating or living with weight issues? Dreadful aren’t they? What if we were to justify to ourselves and others that we have weight issues because “we have a bad metabolism”. Brilliant solution to our weight problem. Or is it? Blaming something you have no control over is not empowering nor does it give you the motivation to make the necessary changes. Would you agree that isn’t helpful? Would you also agree that saying you have a “weak side”, a “broken immune system”, are “unlucky or its Karma”, or that this just r”uns in your family”, does nothing to help us find the means necessary to improve health and kick MS to the curb? The frist step to become empowered and recover from MS will be to stop the blame game. Returning to our example: Would we blame our weight issues on food? The food did it! Some people will but it’s not accurate. Andrew Austin, who does neurolinguistic programming (NLP) trainings for weight loss, would have the front desk in is classes covered in sweet pies, cakes, and donuts on the first day of his weight loss training. Everyone would come into the class and be appalled! Why do you think he did that? He did that because the food is not to blame. The problem is the relationship to it, the behaviors around it, and the emotional issues that food masks. Work on those issues, put the responsibility back us, and not the food, metabolism, genes, etc and we have a chance of creating the necessary changes to keep ourselves slim and healthy no matter how many donuts are in the room. So what if we did the same with MS? What if we stopped blaming the immune system and its reaction to our nervous system? What if we took full responsibility for finding solutions to everything that is causing our bodies to express disease? That is what the Creating Health series wants – to give us as many effective solutions to reversing multiple sclerosis from the inside out. Recovery from multiple sclerosis is about being proactive. By addressing all aspects that could be causing our bodies to MS, we have the greatest chance, no matter how wonky our immune system is, of becoming healthy and resilient. Can You Recover from MS? Your job is to use all the information on the different techniques and modalities out there that have helped others heal their MS, and find your ideal combination. 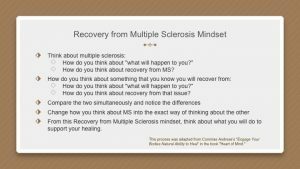 My job, Eva M Clark, in this post and this month’s Creating Health Series, is to help you change your mindset concerning MS so that you feel motivated and believe that recovery from multiple sclerosis is possible. Currently, even though you might be interested in healing and have tried a few modalities, you probably don’t believe you can recover. That is why so many give up so easily. So the first step in recovering from multiple sclerosis is believing it can be possible. NLP is the study of successful mindset structures. An NLP practitioner helps the client discover HOW they are doing the problem and then helps them discover HOW to to succeed instead. Sounds strange doesn’t it? At the moment our problem is we’ve bought into the belief mindset that MS is an “incurable disease that will only get worse”. And that mindset helps to keep the disease in place! We want to change that mindset to one of recovery. This new mindset will open up possibilities and give us the motivation to go beyond managing and into actively creating health. Is there a multiple sclerosis personality? An MS personality? Behaviors, attitudes and ways of being common to those diagnosed with multiple sclerosis? To begin this discussion, we must first understand ‘what is personality?’ Because personality is not “just the way I am!“. Personality is the behaviors learned and the goals that motivated us in childhood. And these behaviors and goals became stable over time. And once they become stable, they become unconscious. Just like driving a car. Once you’ve learned and done it enough times, it can become habitual, and you drive without much of an awareness that you are doing it. Similarly, we learn these patterns of behaving, and they become our automatic response to life. It is not your identity. These are adaptations to childhood stressors. And unless you get a wake-up call of some sort, such as multiple sclerosis, you’ll continue to respond this way. Are there habits, beliefs, and behaviors common to those diagnosed with MS? Take the test below and then continue reading or watching the presentation. How is the Multiple Sclerosis Personality Formed in Childhood? Interestingly enough, the personality traits that were most admired and encouraged in childhood are the ones that later become multiple sclerosis. Why? Because as they develop further and gain incredible importance in our lives, they become unsustainable. The almost superhuman traits cannot be maintained by the human body. Traits such as being a good student, the favorite daughter or the hard worker or athlete become, as it continues to motivate us and increase its importance, a never-ending strive for success, overachievement, and to do lists. Things can always be done even better… Even carrying for others develops into an inability to say “no” even when we are exhausted. Helper becomes an automatic way of being, jumping at any request, and being helped is nowhere in the picture. Emotions? Emotions are for others as, through childhood and early adulthood, we’ve learned that they are not ok and thus repress them. These are some of the examples of how some of the multiple sclerosis personality traits are developed. Everything is ok and a strength, until these behaviors and beliefs takes over our lives. We need to develop the resources to create balance in our behaviors. By understanding the positive intention behind the behavior and when it’s useful, we can begin to understand healthier ways to achieve that intention. Symptoms are only feedback. The body is saying ‘this way of behaving is not sustainable.’ It is requesting action. Once the action behind the symptom is taken, the symptom is no longer necessary. — Eliminate the inner critic and create the inner coach. — Make peace with perfection. 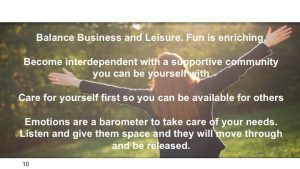 — Creating inner congruency and balance. Become conflict-free. — Create strong boundaries around others. — Removing the belief “I’m not enough / worthy” once and for all. — Get your needs met. Put yourself first before helping others. — Understand and harness your relationship with control. — Become guilt and shame-free. — Exploring any unconscious inner obstacle to healing. Is MS serving you more than you think? — Release the trauma of a negative diagnosis and the expectations it’s going to get worse. 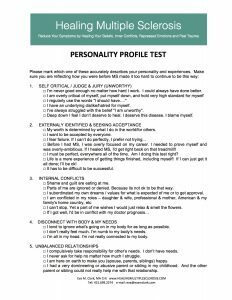 As these personality traits begin to change into healthier mental patterns, they become sustainable and fulfilling, and the body is relieved of its burden and can begin to heal. The amazing results of those that have worked with me as well as those I interviewed during my journey to develop the most effective healing program for multiple sclerosis is testimony of the incredible shifts that can occur. Don’t do this alone. There is help. Your MS personality is not who you truly are; it’s who you learned you had to be. If you would like to receive these videos on healing multiple sclerosis as they are published directly in your inbox each month, please sign up for our newsletter. This series was produced by Eva M Clark and recorded at the National MS Society Self-Help MS Group in Santa Cruz, CA. The National MS Society respects the rights of people with MS to obtain any and all information they want related to MS, including information on wellness, medical treatments or complementary therapies, and products or services. The information presented at these meeting does not necessarily reflect the views or official position of the Society, nor carry the endorsement or support of the NMSS. Read our disclaimer here.